Some of the most flavorful cuts of beef are also the most tough. With this recipe for Barbecued Beef Brisket, we’re going to take one of the toughest cuts of beef, apply some tenderizer, braise it, boil it, cook it in barbecue sauce, all done without a grill, and end up with a very tender meal. Be aware that this is a recipe that takes time. From start to finish is about 6 1/2 hours of preparation and cooking. The results are worth the investment in time. We use a couple of what might be hard to find ingredients in this recipe which are Onion Juice and Garlic Juice. We feel that for this brisket roast that the Onion and Garlic Juices instead of sliced onion and minced soak garlic let the flavors soak more deeply into the food and impart a lighter flavor since the flavor is more dispersed. You can find these onion and garlic juices in Safeway Stores and we’re trying to find a supplier for our e-store. Evenly sprinkle the Adolphs Tenderizer over both sides of the brisket. Season with black pepper, and then brown the brisket on all sides in a large dutch oven that has been coated with canola oil. Add water to the dutch oven to cover the brisket, and then add the onion juice, garlic juice, and Tabasco sauce. Bring to a boil, cover, and simmer for 2 1/2 hours. Remove the brisket from the dutch oven and discard the water. Wash the dutch oven, dry and lightly oil with canola oil. Place the brisket back into the dutch oven. Place the following in a non-stick 2 quart saucepan: barbecue sauce, vinegar, Worcestershire sauce, brown sugar, and liquid smoke. Heat, and stir until the brown sugar is dissolved, then pour over the brisket. Cook for 4 hours, checking every 45 minutes, turning, and making sure the sauce stays moist. 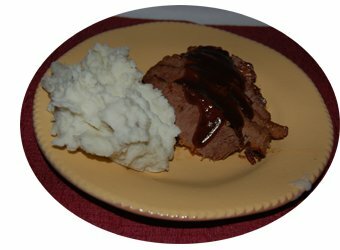 We served our roast with Garlic Mashed Potatoes and used the barbecue sauce with cooked with over top of the sliced brisket. Tip: When cutting the brisket, cut across the grain so that the tough fibers in the brisket are severed. It seems to us that grilled foods have more flavor than foods that are simply baked or pan fried, so we BBQ our dinners about half of the time. For weeknight barbecues, we cook foods that grill in under an hour, these are the typical foods like steaks, chicken breasts, hamburgers, and pork chops. But when the weekend comes around, and we can start cooking our dinner earlier, we cook more interesting foods like pork roasts, and pot roasts. Earlier this summer we posted here in our blog a recipe for a delicious smoked North Carolina Pulled Pork Sandwich, which starts with a pork roast barbecued and smoked. It takes some time to make, but the reward is worthy of the effort. Another roast that we love to cook on the barbecue is the chuck roast (pot roast). Chuck roasts are a very flavorful cut of beef that must be cooked slow in order to become tender. When baked in an oven, it’s typically roasted at 325° F for 3 hours. It would be a tall order to cook a chuck roast on the barbecue for that long, so we enlist the aid of Adolph’s Meat Tenderizer in order to cut the cooking time by an hour or so. The magic of Adolph’s is Papain (from papaya fruit) that breaks down the tough parts of the roast. Many folks think Adolph’s has MSG in it, since it looks almost the same, but there is no MSG in Adolph’s tenderizer. Select a nice 3 – 4 pound chuck roast. Look for a roast that has less fat in it. Combine 3 1/2 tsp Adolph’s Meat Tenderizer with 1/4 tsp Tabasco Sauce, 1/3 cup ground black pepper, and 1/3 cup sugar. Mix the Adolph’s, Sugar, and Pepper together until well blended. Place the chuck roast on a large plate, and coat all sides with the seasoning mix. Place the roast in a plastic zippered bag, and refrigerate for an hour or so. Prepare your grill for cooking. If you’re using a charcoal grill, place the coals only on one side of the grill. 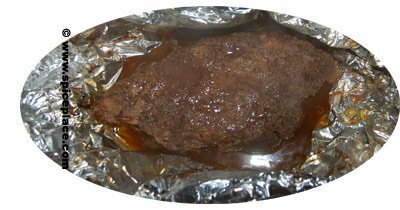 When the grill is ready for cooking, place on your kitchen counter top 2 or 3 layers of wide, heavy duty aluminum foil that are large enough to completely wrap around the pot roast. Place the roast on top of and in the center of the aluminum foil. Sprinkle the top of the roast with garlic powder, and top with a thick layer of sliced onion. If you have room, you could toss some 1 1/2″ chunks of peeled potatoes and baby carrots into the foil around the edges of the roast. Close up the foil tightly, and place on the grill 3 to 4 inches away from the heat. Cook for 1 1/2 to 2 hours, turning every 20 – 30 minutes so that the roast cooks evenly. When you feel the roast is done, open and test the temperature with a meat thermometer. The temperature should be at least 165° F.
If you cooked this Grilled Pot Roast with the vegetables, you’ll have a complete meal all cooked on the grill. If not, serve with our Tabasco Garlic Mashed Potato Recipe, gravy and a vegetable of your choice. Since it’s summer and the vegetables are rolling out of the garden quite regularly, we thought we’d share a recipe of our for Stuffed Bell Peppers. We’ve enjoyed this recipe for years, and it’s been handed down a couple time throught our family. I’m sure we’ve made adjustments to this recipe over time, and this is our current formulation of Stuffed Bell Peppers. The number of steps listed below make this look like a complex recipe but honestly stuffed peppers are a simple meal to make. Place beef broth in a saucepan and bring to a boil. Add the basmati rice to boiling beef broth. We prefer basmati rice and you’re welcome to substitute your favorite rice instead of basmati. Reduce heat to simmer and cook for 12 – 15 minutes. Cook lean ground beef (or turkey) with black pepper, chopped onion and garlic. While rice and beef are cooking you can cut the tops off the peppers and remove the seeds. If you want to speed up the cooking time at the end you can blanch the peppers first but cooking in boiling water for about 5 minutes. If necessary drain any grease from the cooked ground beef. Mix the cooked basmati rice with cooked ground beef. Melt butter in a microwave oven. Add bread crumbs and Parmesan cheese to melted butter. This will create a crumb topping for the stuffed peppers. Place cooked beef and rice mixture into peppers. 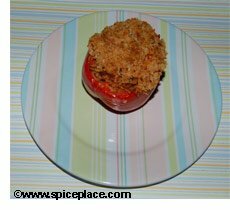 Top peppers with crumb mixture. If we were to survey a hundred people and ask them to name a gourmet food, the chances that a hamburger would end up on that list are between zero and nil. So what’s the deal with the name of this article? Durkee Seasonings has a new seasoning blend named Gourmet Burger Seasoning and it’s quickly become our favorite way to season our grilled hamburgers. And even though salt is the first ingredient in the ingredients list, there really isn’t too much salt in the mix. I’d know because I haven’t used salt in cooking in years. There’s two ways to use Durkee Burger Seasoning, mix the seasoning in with the hamburger meat, and then form the burgers, or to simply sprinkle on the hamburgers before cooking (or right before serving, which makes 3 ways, I think). My preference is to mix the seasoning into the meat before cooking. 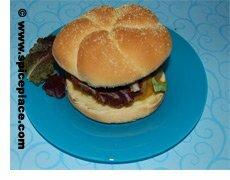 If you’re using pre-made frozen burgers your choice is limited to sprinkling the burger seasoning on the hamburgers. Either way results in a delicious tasting burger, and I feel the blended in method results in a more deeply seasoned hamburger. When mixing the seasoning into the hamburger use about 2 tsp of seasoning per pound of lean ground beef. Add 1/4 tsp of Tabasco Sauce if desired. For food safety reasons, always cook hamburgers to 170° F (medium well). We like to serve our grilled hamburgers on toasted Kaiser rolls, along with Cheddar cheese, sliced pickles, and condiments like ketchup, mustard and mayonnaise. Side dishes that go well with this meal are macaroni salad, cole slaw, potato salad, or a tomato-cucumber salad. If you’re having a weekend barbecue party, you might want to make all of the salads so your gets can choose their favorite. Summer weekends seem destined for barbecuing outdoors. By cooking outdoors, we don’t add any additional heat to our homes, and the barbecued foods we make take on additional flavor from the grill cooking. Plus it’s a great opportunity to use our deck, and enjoy the company of our family and friends. The most frequently outdoor grilled foods are steaks, hamburgers, hot dogs and chicken pieces. We often venture beyond the usual and regular readers of our blog know we’re not afraid to cook beef roasts, pork roasts, whole chicken, and ribs. But, today we’re making a recipe that’s straight forward, Canadian Seasoned Rib-eye steaks. If you’re a new barbecuer, this is a great starting recipe and is about the easiest barbecue recipe around. 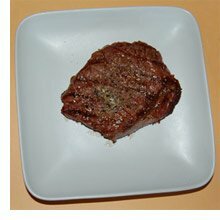 At one time we’d eat one of these ourselves, but nowadays, we split the steak with another person. We don’t have a gas grill and always cook on our Weber kettle grill. We prefer the charcoal cooking over gas grills and also love the more basic cooking method of charcoal. It’s hard to explain, but I think there’s a feeling of pride in being able to cook well outdoors with basic unregulated cooking appliances like the Weber. There is a raw naturalness to it, that doesn’t exist in our everyday modern lives. So light the barbecue, you’re welcome to use your gas grill. When the grill is ready, sprinkle the Ribeye Steaks with Canadian Steak Seasoning, and grill them close to but not right over the coals for about 5-8 minutes for the first side, and 4 minutes on the other side. Cut the steak to check for doneness, and continue cooking if needed. Sprinkle a little more Canadian Steak Seasoning just before serving. There’s no need for barbecue sauces with this recipe. Simply cook, season, and serve. This is a recipe for a deliciously different beef stew made using Old Bay Seasoning. The ingredients are for the most part the standard beef stew items. The difference in this recipe is the seasoning, which is, of course, Old Bay. We love Old Bay Seasoning, and are always seeking new uses. Cut the rib eye steak into about 1/2 cubes. Place beef in a 3 quart stock pot, and cook until browned. Add chopped onion, celery and chopped garlic. Cook 3 – 4 minutes or until onion is translucent. Add chopped red pepper, and cook for another 5 minutes, stirring often. Season with 1 tbsp Old Bay Seasoning, and cook for 5 – 10 mintues. Add 10 – 15 fingerling potatoes (or 1 potato chopped fine). Cook, stirring often, for 20 minutes. Add canned mushrooms, and cook for another 5 minutes. Spaghetti sauce is a good weeknight meal because you can go from idea to table in 30 minutes. You don’t need to buy the expensive prepared sauces from the grocery and can make a better sauce at home almost as quick. We’ve seasoned our sauce in the recipe below using McCormick Spaghetti Sauce Mix, but you can feel free to replace the mix with 1/4 to 1/2 tsp basil leaves, 1/4 to 1/2 tsp oregano leaves, 1/8 tsp black pepper, and about 2 tbsp whole wheat or white flour [as a thickener]. We simply find the mix is a little easier to use as all of the ingredients are in the proper proportions already. 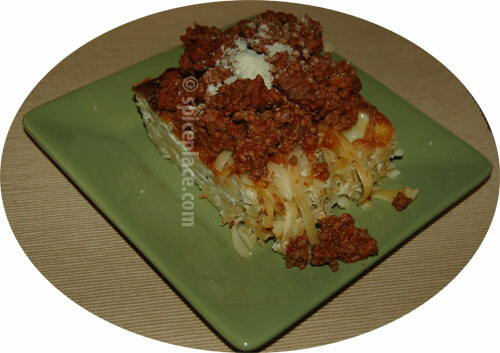 Note in the pictured recipe we used whole wheat spaghetti noodles for the pasta. Brown the ground beef in a 3 quart non-stick sauce pan. Drain any grease. Add the diced onion, and pepper to the ground beef and simmer about 4 – 5 minutes until onion is translucent. Add the tomato sauce and water, mix in McCormick Spaghetti Sauce Mix, and stir well. Simmer to spaghetti sauce, stirring often at least 10 minutes, until desired thickness is reached. While the spaghetti sauce is simmering, prepare your favorite pasta noodles according to directions on package. 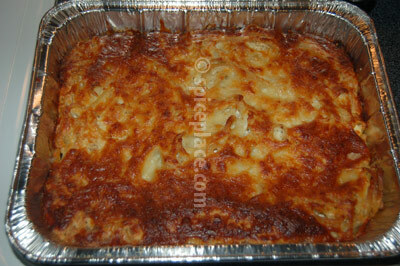 Add mushrooms last, stir, and serve with spaghetti noodles, grated Parmesean cheese and garlic bread. Any white bread or rolls. We use 2 sub rolls, tops and bottoms. Cut butter in small 1/4 – 1/2 slices and place in a pyrex cup. Microwave the butter about 10 – 15 seconds at a time until butter is melted. Add chopped garlic and stir well. Let the butter garlic mix sit about 5 mintues. Stir. Meanwhile, preheat broiler and place a layer of aluminum foil on a cookie sheet. Place bread on sheet, and spoon and try to evenly spread top of bread with the butter garlic mix. Be careful not to add too much garlic to any single slice of bread. If making a large amount of garlic bread you can double the garlic butter quanities as required. Spinkle top with grated Parmesean cheese and broil about 1 minute. Watch carefully as this will burn quick. Since it’s Saint Patrick’s Day today, we thought we re-share a favorite recipe of ours, Old Bay Seasoned Corn Beef and Cabbage. We shared our unique and different recipe here with our original post to the blog back in December. Our staff had been considering making a different recipe for corned beef and cabbage to share today, but in the end we decided our recipe using our favorite seasoning (Old Bay) is so good it was best just to re-visit our original and classic recipe. The picture to the right shows the recipe for Old Bay Corned Beef and Cabbage in a dutch oven all prepared and ready to cook. Note the tea ball in the center of the pot. It contains the pickling spices is a neat trick to keep the mustard seeds in the pickling spices from spreading throughout the pot, yet lets the pickling spices season the food. This is a delicious and fairly easy to make recipe for Beef Stew. Since the recipe includes Adolph’s Tenderizer, you can use the tastier (and tougher) cuts of meat to make this beef stew, such as chuck or brisket. The Adolph’s Tenderizer combined with slow cooking will break down the tough fibers in the chuck or brisket, and make for a tender meal. Put flour, tenderizer and seasoned salt in plastic bag and mix together. Place beef in bag and toss to evenly coat beef. Heat canola oil in large dutch oven. Place beef in oil and brown, stirring to cook all sides. Add celery and onion to the dutch oven. Cook about 5 minutes or until onion is translucent. Add Worcershire sauce, tomatoes, beef base, and water; mix thoroughly. Bring to a boil and then add bay leaves, mushrooms, carrots, and potatoes. Simmer the beef Stew for 2-3 hours. You adjust consistency and make a little thicker with a little water and cornstarch mixed together and then adding to Beef Stew. Stir, and cook for 10 minutes more, stirring a few more times. Serve Beef Stew with hot biscuits or corn muffins.